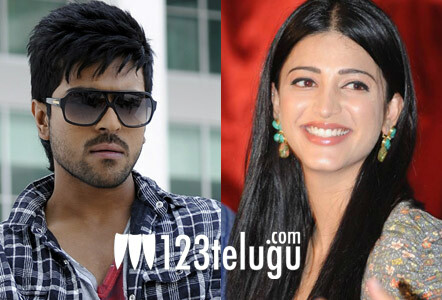 Shruthi Haasan and Charan to pair up again ? Looks like the Srinu Vaitla, Ram Charan project is getting bigger day by day. According to the latest update, Shruthi Haasan is being considered as the female lead. The makers have almost zeroed in on her, but an official announcement is still awaited. Shooting of this film will kick start, once Sreenu Vytla completes filming for Aagadu. Shruthi has already paired up with Charan in the super hit film Yevadu. Ram Charan will sport a rugged look in this film, and has also started training for the same. More details on this film will soon be revealed.